This is the Ethiopia Meaza brought to you by Coava Coffee Roasters. 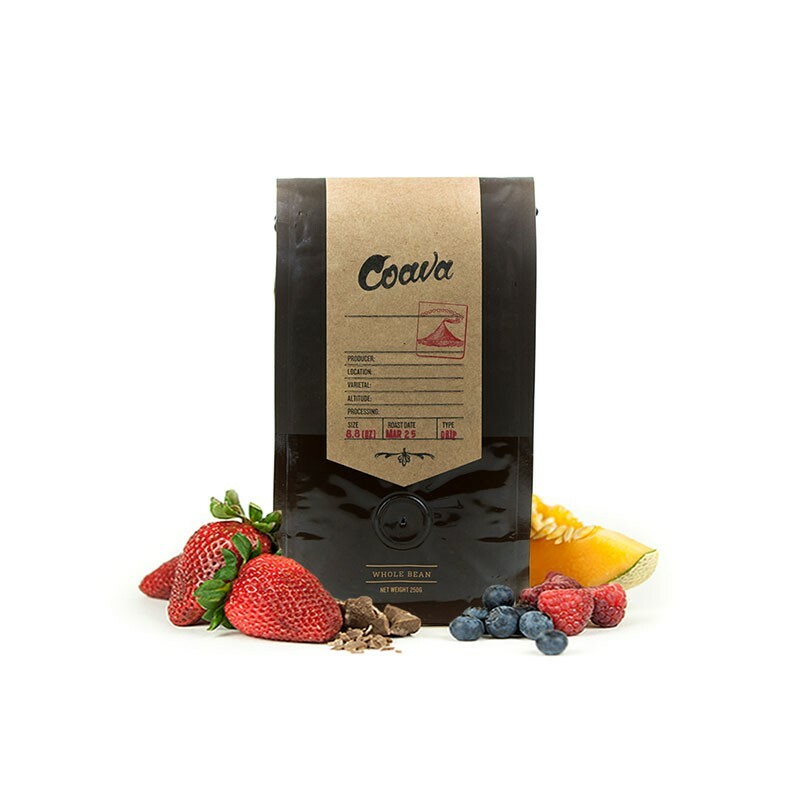 This fully washed coffee was sourced from the growing region of Chalalacktu, Borena in Ethiopia and was produced by the Kochere Cooperative between 1,975 - 2,000 meters. In the cup you'll find a floral aroma, tropical fruit, lemon zest, baking spice and a rich cacao nib finish. I love the lightness of this coffee that makes it easy to drink and refreshing. A floral arrangement of flavors hit your palate with a lingering sweetness that ties everything together. I can understand why some people might not enjoy the "tea-like" feel because the coffee is so light and airy, but I think it makes for a refreshing cup especially as we head into the Summer months. Coava hit it on the nose for me with this one. Typically I lean toward fruity coffees with big berry profiles, but the nuance and sweetness of this one really impressed me. Like a mid-morning tea with a healthy dose of honey I found its profile easy to drink with a velvety mouthfeel. What a treat! I love African coffees. The more the better. Tea like with rose and jasmine notes. I got dessert with honey, vanilla, caramel and a dusting of light chocolate. Subtle citrus in the finish. Very enjoyable coffee with very light flavour. Smells and tastes very much like black tea. Would, however, enjoy something with a stronger flavour next shipment. This coffee is different than a number of others I have brewed fro the Kochere region. It needs it's rest time since brewing it a couple days post roast resulted in a cup with no character. At about 5 days post-roast, black tea and raisins come to mind. Preferable as a chemex brew compared to the kalita wave. I really like this coffee. It feels really classic and comforting. I think I'm ready for something a little more wild. I just got the KRUVE, which has led to a lot more consistency in the extraction, but it's also made the flavor palate feel less complex. I might change my flavor profile! Awesome coffee in body and has a wonderful complexity that changes with every cup. 195 degrees on the water and kalita or v60 or chemex all work well. My favorite cups have come out of the 1 cup v60. Has an awesome depth and great aroma. Very nice coffee. Taste is somewhat muted, but there's just enough going on (subtle floral notes, a bit of chocolate) to be a very pleasant cup of coffee. While there's nothing to dislike about this coffee, there isn't much to love. It's rather muted and not very interesting. Like the last coffee I had, pretty prominent tea notes, which are not my favorite but nice to be in the mix of coffees I receive. Clean cup, no bitterness in Chemex. NIce aftertaste. Overall pretty nice cup, but not my fav in flavor profiles. Solid coffee as all Coava's are but a somewhat boring taste profile. Very smooth, just a tiny nuttiness on the finish at that was it. Delicate flavors are too light. Rose and black tea are all I can taste without careful attention. This was a very interesting bean because it honestly tasted quite a bit like tea! A tad too delicate for my tastes, as another reviewer pointed out, but I still enjoyed it. This was average for me. I could drink this one semi often but it still kind of reminded me of the Kenya Kabiruini which I didn't like that much. Coffee was a little too light for my tastes. This was really tea like with light fruity notes. I got orange and lemon front my kalita wave. Good but I definitely preferred the previous coffee. Maybe I'd prefer it to be a bit more aromatic. The more I drink of this-- the less I like it. Solid roast. Couva is always dependable. Love this coffee. Wonderful aroma, smooth, multi-layered taste. Clean, soft floral notes. Leaning towards juicy melon, and berries. Too tea-like. Not enough coffee flavor. Excellent. Their packaging makes it a little harder to keep it fresh but the coffee is excellent. This coffee is good, but almost too delicate. The black tea and rose blossom make the experience like drinking tea instead of coffee.